Patrick Bresnan, along with his filmmaking and life partner, Ivete Lucas, have been making visual works together for 8 years since meeting on a photography trip through Mexico. Together their output has been frequent and varied: documentaries, video art pieces, installations—but a small town on the outskirts of the Everglades has recently proven irresistible to their attentions. Pahokee, Florida and the surrounding area has been the focus of their last 3 shorts, and in the process the work has established the duo as the toast of the independent documentary world, with back to back Sundance premieres, and, potentially, an Oscar nomination this year. The Rabbit Hunt, debuting online thanks to the new magazine Topic, is the second of these 3 films, a number that is expected to rise as the shorts are assembled into a planned feature film comprised of 10 parts. It is an extraordinary work that has won 19 festival awards and counting, to which we add our highest praise. Shot in a verité style, the film is an ethnographic observation of something that, to our urbane modern eyes, feels like an anachronistic custom—rabbit hunting. 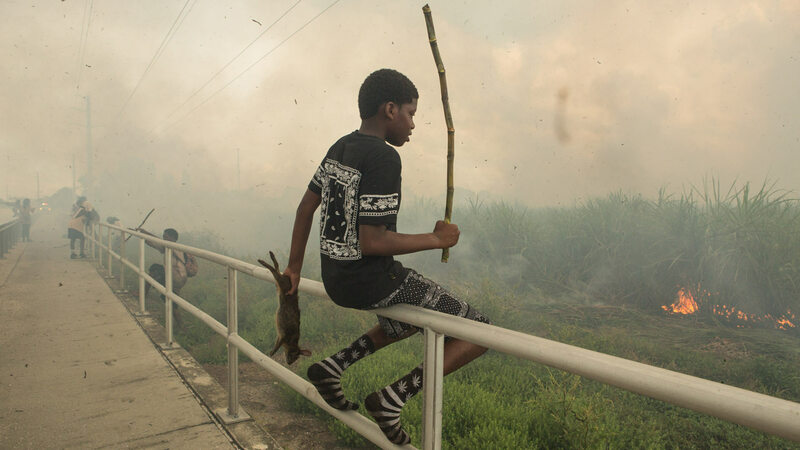 Practiced in the fields with clubs and sticks rather than guns, the violence is beautiful and terrible to behold, as young black men display skill and agility in whacking rabbits dead and carrying them back to their communities for feasting and celebration. Hunting is an entrenched custom in many places in America, but there is something riveting about the hands-on brutality of the Pahokee resident’s sport. It is easy to be outraged, but to feel so is to be willfully hypocritical when considering the heartbreaking and largely invisible torture of animals that brings meat to our supermarkets. This tension nonetheless exists though, and is many ways the defining trait of the film—a deep uncomfortableness aroused across several vectors, as you celebrate the tradition, the achievements, and the sense of community the ritual fosters, but then contrast it with the existent baggage of the American project: its shameful legacy on race, poverty, and rapacious capitalism. Despite the verité approach, Bresnan and Lucas undoubtedly lean in on the juxtapositions that give the film its haunting power. The hunts take place on an industrial sugar farm, and it is the movement of these giant tractors, and the controlled fires of the brush, that flush the rabbits out. The smoky ash in the air is almost apocalyptic as it darkens the sky, and an implicit commentary feels ever-present—these supremely poor communities, lacking in jobs, are forced to opportunistically scratch out food on the margins of vast capitalized wealth. The strength of large machines render human labor redundant, and supply the community with a product that is bad for them. One of the most sly inclusions of the film is a shot from the morning before the hunt where a truly remarkable amount refined sugar is poured into a bowl of cornflakes and served to the family. The film provides in this way a capacity for varying interpretation that makes it unnervingly effective. It is fuel for anti-capitalism—a leftist critique of society, potently distilled, where communities are simultaneously impoverished and held in thrall to big business. But, implicit revulsion to the practices depicted can also power paternalistic hand-wringing over the “pathology of poverty”, an attitude associated with right-wingers. The anthropological bent of the film makes it feels like a posting from a third-world country, not the richest nation in the world, and the lifestyle is so alien to so many in America, it serves as a Rorschach test to lay bare prejudices and assumptions. What both perspectives share is a condescension towards a way of life and traditions that have emerged over decades—condescension that is deeply rooted in race. While the film stokes these feelings, it also works to defuse them. You can adopt Bresnan and Lucas approach too: disengage from judgement and self-righteousness, and seek beauty. Considering the time the team has spent in Pahokee via their previous short The Send Off, and The Rabbit Hunt, it is natural for a closeness to emerge, and I think it is clear that Bresnan and Lucas’ depiction of the community is meant to be salutary. In an interview with the Dutch magazine Mister Motley, Lucas describes a desire to depict a non-mainstream America—one that is black and rural—and shine a light on daily life in this world. If we can leave behind our baggage, what we see is ingenuity, feats of skill, and a coming together of peoples. We see the rituals of a community, not a problem to fix, but a reality to celebrate. Maybe if, in the future, this type of depiction wasn’t so rare, our reactions wouldn’t be so jumbled. Bresnan and Lucas are doing their part to bring about that future.